It’s no secret that California is home to some of the best hiking in the country, especially in the northern part of the state. With a lifetime’s worth of hiking opportunities, the tough part can be zeroing in on one location to use as a base camp to explore all that Northern California has to offer. With a vast expanse of mountain ranges, wild rivers, and quiet forests just beyond downtown, Redding is the perfect spot to lay your head after a long day on the trails. 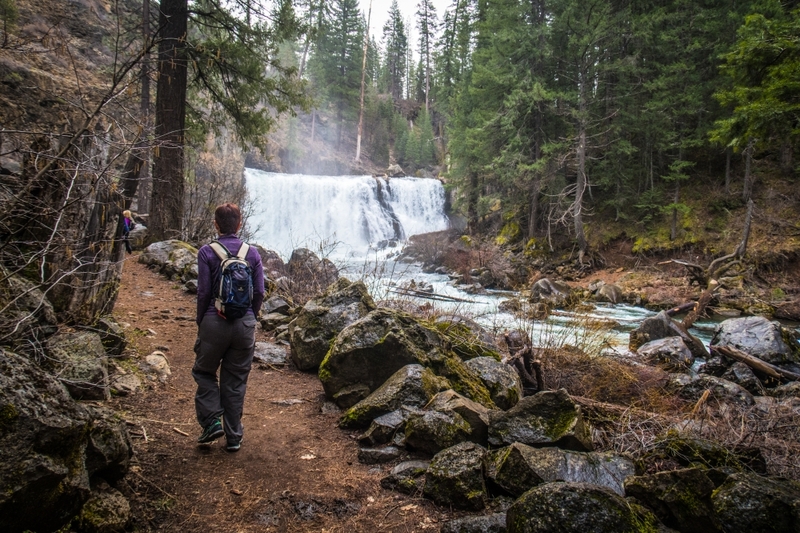 Here, we’ve rounded up the 11 best hikes to experience the unparalleled beauty of northern California, all within 90 minutes of Redding. 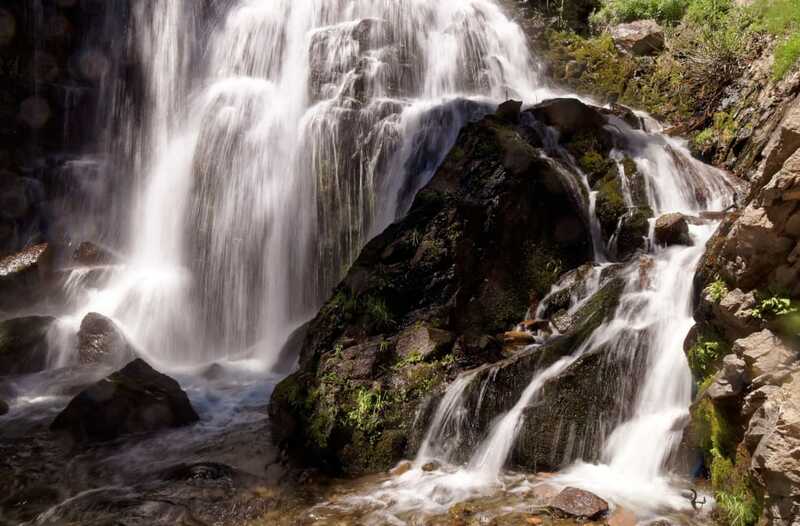 Also, request a Redding Visitor Guide or Trails Map, which includes waterfall hikes. 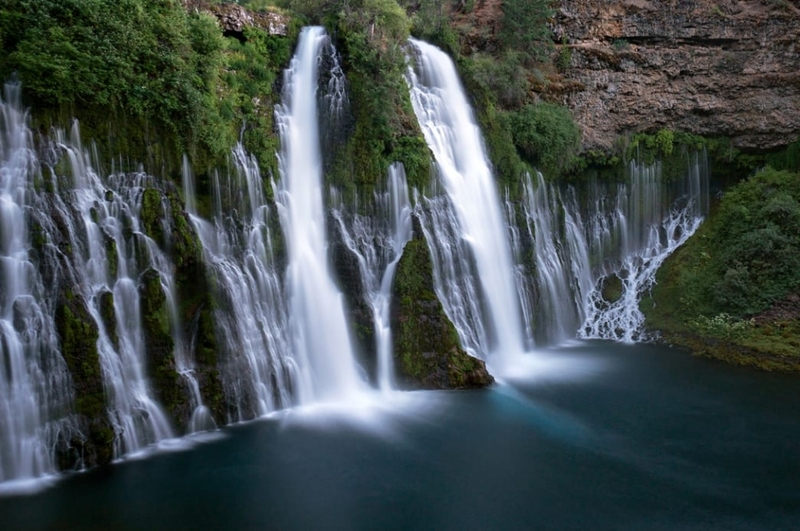 Burney Falls is a sight to behold. When President Theodore Roosevelt visited these misty, mythical-looking falls, he claimed them to be the “eighth wonder of the world.” The 129-foot, spring-fed waterfall is the centerpiece of McArthur-Burney Falls Memorial State Park (entrance fees apply), situated in the lush Cascade Mountains northeast of Redding. This easy loop trail brings hikers to a vista point above the falls before descending into the basin right to the foot of the powerful cascade. These magnificent falls delight onlookers year round, as the underground source springs create continuous water flow. Stunning alpine lakes, granite peaks, and pristine forests make this hike a true wilderness gem. This little-visited trail in Castle Crags Wilderness starts at Castle Lake and traverses the ridgeline to Mount Bradley, offering up sprawling views of Mt. Shasta and the surrounding Cascade Mountains along the way. A challenging out-and-back trek with several steep climbs totaling 2,300 feet in elevation gain, the Castle Lake Trail is ideal for seasoned hikers who prefer to explore this granite wonderland in solitude. The chance to hike up and into a cinder cone—a steep hill of debris created by volcanic lava flows—makes this trail a wholly unique experience near Redding. In addition to the cinder cone itself, this out-and-back trail introduces hikers to many of the beautifully bizarre wonders of Lassen Volcanic National Park: the impossibly colorful Painted Dunes, the rugged rock fields of Fantastic Lava Beds, and the foreboding Lassen Peak. From the top of the cinder cone, a swirling network of trails invites hikers to explore down into the blank crater. Spectacular views of Castle Dome and Might Mt. Shasta in the background reward you on your hike. The towering 6,000-foot granite domes and spires jutting out of the dense pine forest are undoubtedly the main attraction at Castle Crags State Park. The park offers 30 miles of trails, and the Crags Trail lives up to its reputation as the most sought-after adventure. The trail leads right up to the base of Castle Dome, one of the park’s most striking monoliths, with stunning views of Mt. Shasta in the distance. Access the Crags Trail from the Vista Point parking lot or via Bob’s Hat Trail near the main park entrance. Family-friendly, close to town and sprawling views of the Three Shastas—Shasta Lake, Mt. Shasta and Shasta Dam—make Chamise Peak a true Redding classic for locals and visitors alike. This out-and-back hike climbs gradually up a ridge on the Flanagan Trail before branching off onto the Chamise Peak Trail, which leads to the 1,600-foot summit. From the top, views of Mt. Shasta and the Cascade Range unfurl to the north with a clear look at the Sacramento River Valley below. Seeing the 30-foot Kings Creek Falls cascade over tiers of black volcanic rock is the highlight of this hike in Lassen Volcanic National Park. Ferns and shrubs clinging to the rock amid the spray and lofty pines beside the creek only add to the spectacle. The trail starts along Lower Kings Creek Meadow before descending 700 feet to the Kings Creek Falls overlook. The return offers the option for a scenic loop by taking the uphill Cascades Foot section, which runs alongside the creek via a narrow, steep staircase made of stone. The McCloud River Falls Trail connects the three waterfalls, all unique in their own way. 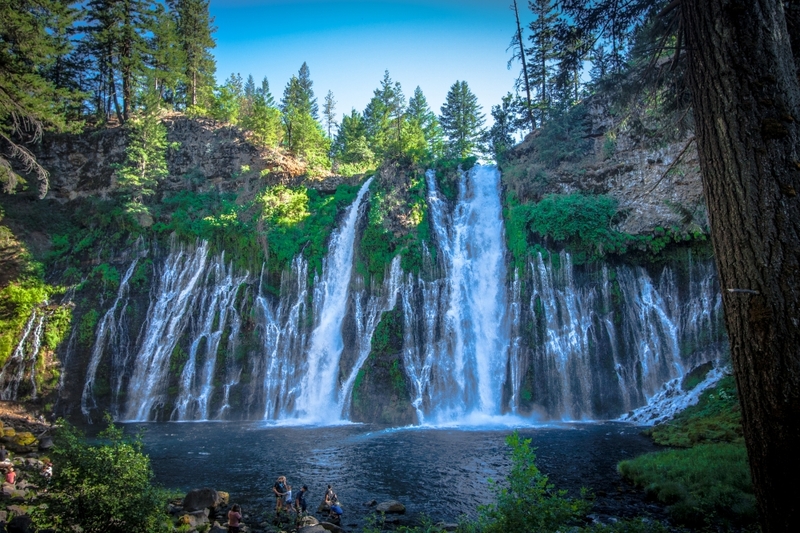 Pictured is Middle McCloud Falls, cascading 40 feet down and stretching 120 feet wide. While plenty of hikes feature a waterfall, this gem showcases three waterfalls on one short trail. Traveling along the McCloud River, this hike explores the wildly unique volcanic environment near Mt. Shasta (think black basalt cliffs and canyons of cooled lava). With only 300 feet of elevation gain through the entire out-and-back, the trail welcomes hikers of all levels and even has a paved, ADA-accessible path to the Lower and Upper Falls viewpoints. The three waterfall lookouts can be reached easily by car as well, giving visitors the flexibility to drive to each cascade or hike the trail connecting all three. 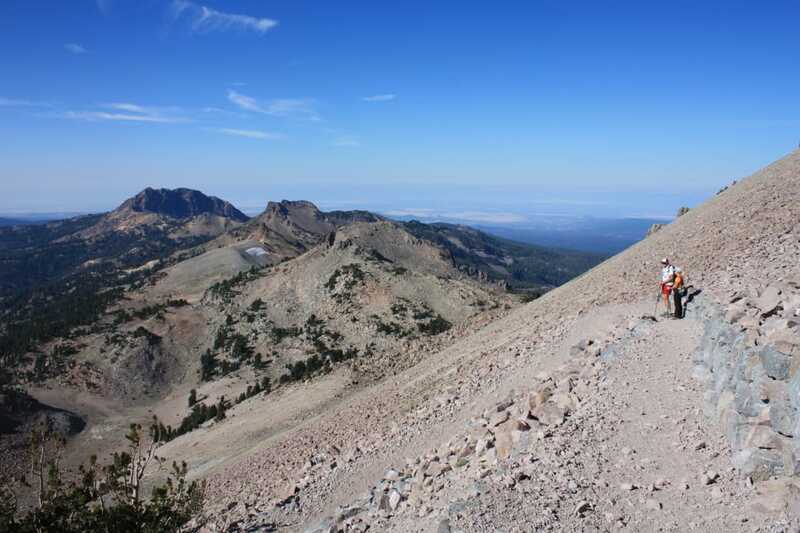 Summiting the tallest point in Lassen Volcanic National Park at nearly 10,500 feet, the Lassen Peak Trail deserves a spot on any California hiker’s tick list. Starting near Lake Helen, the route climbs about 2,000 feet of steep and occasionally rocky switchbacks to the top of this active, but currently dormant, volcano. Those who complete the tough ascent are rewarded with panoramic views of Lassen Volcanic National Park and its otherworldly landscapes, particularly the Devastated Area, which bears the effects of eruptions from Lassen Peak itself. 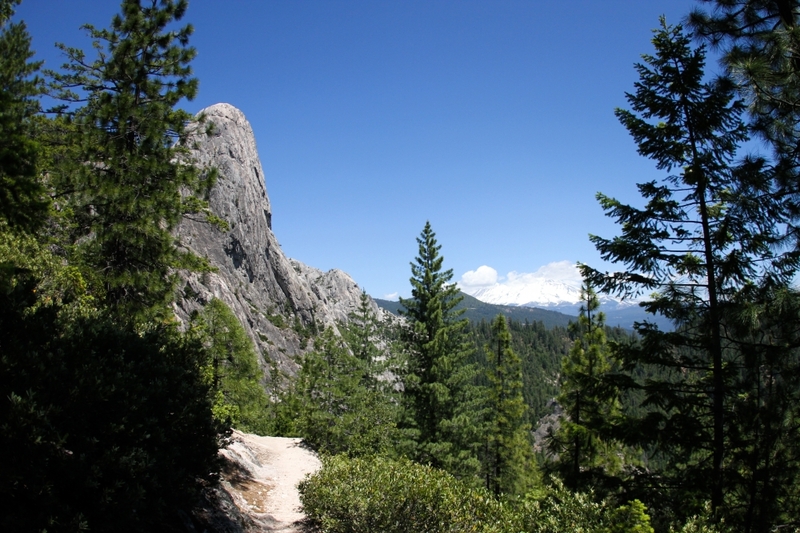 Anyone looking for an easy and ADA-accessible way to explore the serene beauty of Castle Crags State Park (entrance fees apply) will enjoy the Root Creek Trail. This flat, out-and-back trail travels under towering pines before following Root Creek, where the crystal-clear water and moss-covered boulders set a mystical tone. The wheelchair-accessible route starts on the Crags Trail from the Vista Point parking lot, then meets with the Root Creek Trail at the first junction. For more of a challenge, hikers can continue past the boundary between the state park and Castle Crags Wilderness—though, the trail becomes steep and no longer ADA accessible—to a spectacular view of Root Creek Falls and the imposing Castle Dome beyond. If you’re looking for summer wildflowers, take a trip through Paradise Meadows in Lassen Volcanic National Park. This easy hike is accessible from the Hat Creek Parking Area, and the basin below Reading Peak is known for its impressive color throughout the summer. Those looking for more mileage can connect to a trail that will ascend 1,000 feet to Terrace Lake. But there’s nothing wrong with enjoying this trail on its own. You’ll find a nice mix of tree cover in addition to the meadows, and it’s rare you’ll find much of a crowd. This recently rediscovered trail just outside of Redding follows the path of what was once a mining railroad on the east side of the Sacramento River. The 2.9-mile (one-way) trail is connected to the Hornbeck Trail, which creates a scenic 5.5-mile loop. You’ll see lots of evidence of the mining past in the area, including the cuts through bedrock necessary for the narrow-gauge railroad to operate, plus there are signs of the residences that once housed the miners. It’s also a good option for viewing wildflowers in the summer. 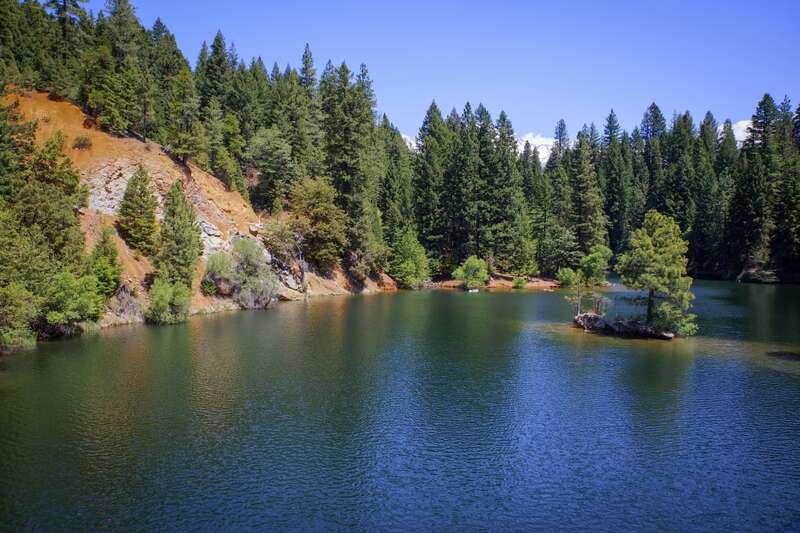 The Redding area, particularly in Lassen Volcanic National Park, hosts free ranger-led hiking programs to broaden visitors’ connection with and knowledge of the areas they explore. June through August, rangers in Lassen Park lead hikes and Junior programs that highlight the unique geology and ecology of the park. Come winter rangers guide groups on off-trail snowshoe hikes through the forest (weekends, January through March). Written by Jenna Herzog for RootsRated Media in partnership with Redding CVB.